Two estranged sisters are forced to rob a bank in order to save their brother. The heist begins smoothly, but mayhem ensues when the defiant bank manager sends them to a basement-level vault -- home to something truly evil. 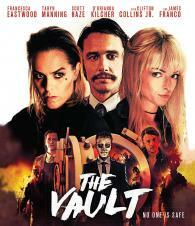 Starring Academy Award® nominee James Franco (SPIDER-MAN, 127 HOURS, PINEAPPLE EXPRESS) and Taryn Manning (ORANGE IS THE NEW BLACK, 8-MILE, SONS OF ANARCHY), THE VAULT is the latest film from genre writer-director Dan Bush (THE SIGNAL).